Could the brain be using electromagnetic fields to communicate between hemispheres — the electromagnetic field theory of consciousness proposed by Johnjoe McFadden (School of Biomedical and Life Sciences, University of Surrey)? According to J. Michael Tyszka, associate director of the Caltech Brain Imaging Center, many areas of the brain display slowly varying patterns of activity that are similar to one another. The fact that these areas are synchronized has led many scientists to presume that they are all part of an interconnected network called a resting-state network. 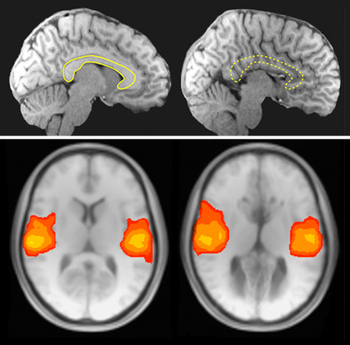 Much to their surprise, Tyszka and his team found that these resting-state networks look essentially normal in people with AgCC, despite the lack of connectivity. AgCC occurs in approximately one of every 4000 live births. The typical corpus callosum comprises almost 200 million axons — the connections between brain cells — and is the largest fiber bundle in the human brain. In AgCC, those fibers fail to cross the gap between the hemispheres during fetal development, forcing the two halves of the brain to communicate using more indirect — and currently unknown — means.